With another Putin-Netanyahu meeting in the rear-view mirror and days away from a Putin-Trump summit in Helsinki, the question of Iran's foreign adventures in Syria is taking center stage. Crafting the right policy also comes as Israel has increased the tempo of airstrikes against forces affiliated with the Assad regime and with the IRGC. 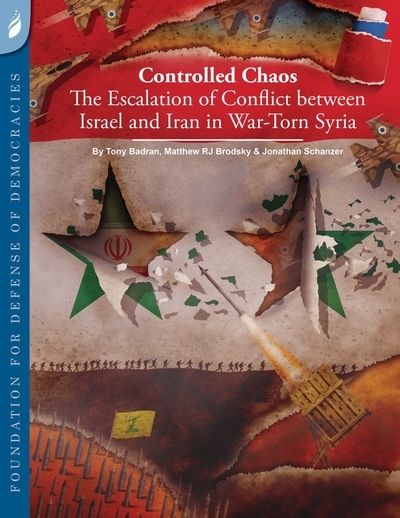 To address these challenges, I'm pleased to present a new in-depth report from the Foundation for Defense of Democracies (FDD), "Controlled Chaos: The Escalation of Conflict between Israel and Iran in War-Torn Syria." Co-authored by Jonathan Schanzer, Tony Badran, and myself, we write that the Trump administration should maintain its presence at the Al-Tanf base in order to deny Iran a contiguous land bridge to the Mediterranean Sea. It should also continue and intensify its sanctions against Iran with a specific focus on sanctioning the IRGC and other Iranian proxies. The U.S. should also impose maximum economic pressure against the Assad regime in response to its war crimes and ongoing human rights abuses. The Trump administration should make it established U.S. policy to achieve an end state in Syria that is free of Iran's Islamic Revolutionary Guard Corps (IRGC) forces and officially support Israel's campaign against Iran in Syria. Washington should discourage Jordan from reengaging in trade relations with Syria, and the U.S. should deny the Assad regime access to oil and gas fields in northern and eastern Syria. As some reports suggest that aid operations in Syria have helped finance the Assad regime, the U.S. should increase scrutiny of UN agencies and international non-government organizations operating in Syria. U.S. Iran policies should be reflected in America's relations with other countries in the region, including Lebanon – which has served Iran's interests even while accepting U.S. aid – and Iraq, which should outlaw Iran-backed Shiite militias. The report is available at FDD's website and for download as a PDF.